In my first blog entry I will write about the cute genius Funcube dongle I got from http://www.funcubedongle.com first batch with serial no. 103. There is lot of fun with this nice toy and I will explain here how to listen AIS messages just with some software this dongle and some simple VHF antenna (marine antenna). After the installation of the device (automatically in Windows 7) you will have a new soundcard (FunCube Dongle V0.0) and a new USB port for control installed. All details for installation you can find on the Funcube Donge homepage . 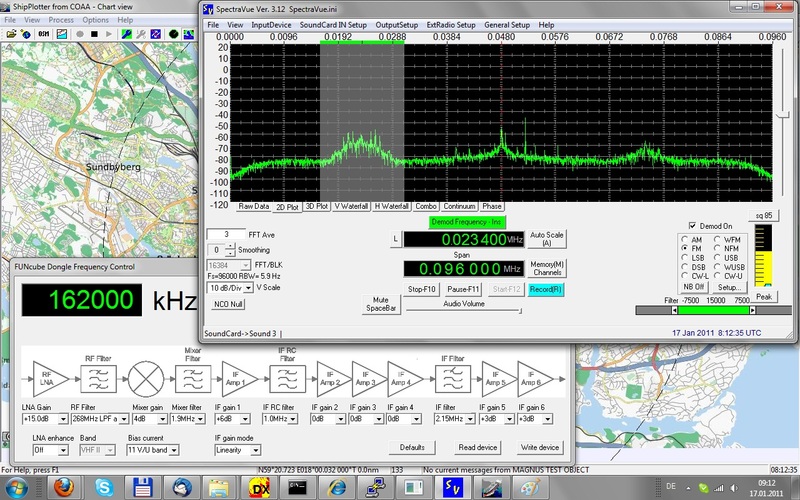 I’ve tried out several programms for the SDR but found the free Spectraview  works out fine after DC and I/Q calibration. For the frequency control there is only the little tool FCHid from the FCD homepage which also allows to set the filter and mixer parameter. Next we need to install a virtual audio cable to link the output from Spectraview into Shipplotter. The software can be found under . We will not need any of the tools just the one virtual soundcard needs to be created. After setup Spectravue according to FCD homepage  the output files will be set to this new device. The reduce DC offset (middle carrier) and image rejection its recommended to have the DC offset and I/O calibration according to FCD hompage  instructions for setting up Spectravue. 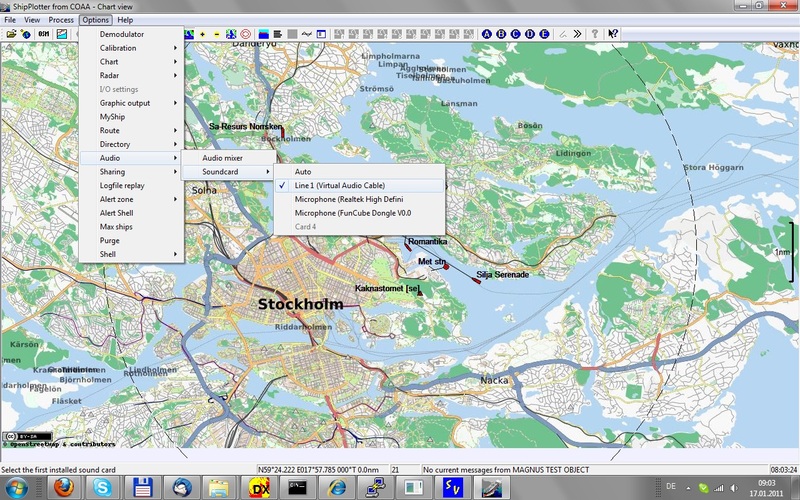 AIS is on 161.975 and 162.025 MHz and if the frequency of the FCHid tool is set to 162.000 Mhz both channels can be displayed on the screen. 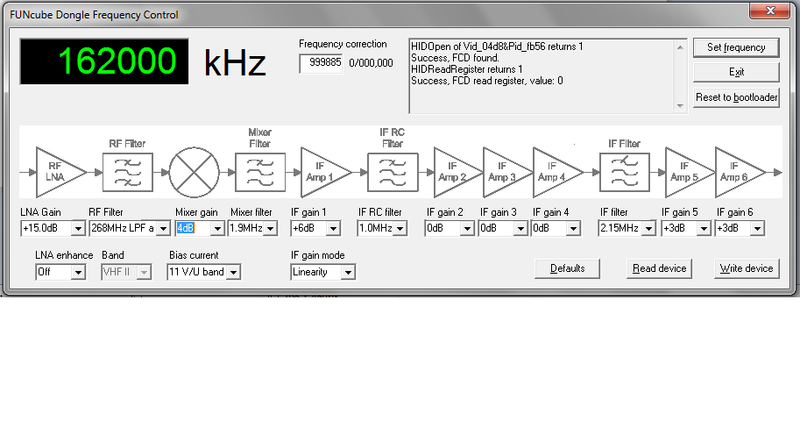 With FM mode just select the one channel, lower or upper channel on +/- 25kHz. In the next step we need to install Shipplotter from  which allows 21 day free trial version. After that time you need to buy a key for 25EUR (+VAT) and I thinks its worth the money. The installation is very easy and the new feature to load maps from Open Street Map project allows you to load nice maps from the internet for every zoom you choose. As sound input we choose again Options -> Audio -> Soundcard -> Line 1 (Virtual Audio Cable). Now we start decoding AIS messages by pressing the green „Start“ button on top and check first if the sufficent audio level is diplayed with the „RAW“ button (looks like a sinus symbol). If the level is ok you should see AIS messages under „Messages“ and on the „Chart“.